People are funny, we get into such ruts; predictable in all we say and do. 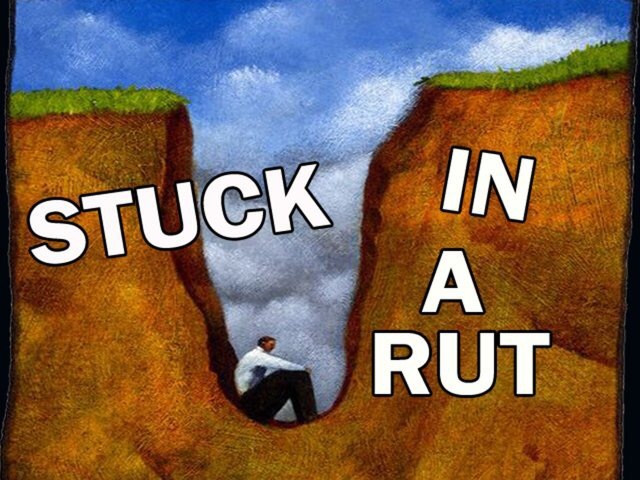 “Stuck in a rut” is an idiom that means a boring lifestyle that never changes. We are just creatures of habit, we fall in comfort zones and stay there. This is ever so true of our prayer life. Do you know what certain people will say when called on to pray? You know some that will start the same way every time, using the same key phrases. Some even say the same phrase over and over throughout their prayer. Creatures of habit, stuck in a rut and comfortable. If we talked to each other this way we would soon find ourselves alone. Sometimes I think we must bore The Lord to tears. Praying is talking to God in conversation. You can talk to Him anytime and about anything. I had a woman tell me her husband was so spiritual because he prayed three times a day. I told her as Christians we can pray unceasingly. In other words, we are open in communication 24/7, talking and listening, always an open line with our Lord. If Christians keep a right fellowship with their Heavenly Father through prayer and reading His Word they can pray unceasingly. So how should we pray? The model prayer, or Disciples Prayer, in Matthew 6:5-13 is a good way to learn how to Pray (talk) with The Lord. (This passage of scripture is often called The Lord’s Prayer but, that’s actually in John 17.) the model prayer: No repetitions here. 1) acknowledge Him 2) praise Him 3) thank Him 4) seek forgiveness from Him 5) intercede for others 6) Pray in Jesus’ name. The Lord gave us a very good model to learn to pray and it’s sad so many simply use it as a recital piece only. Praying should be intentional, like you mean it, not a recitation, habit or duty. It helps me to visualize as I pray.. “Lord, I need the wisdom of Solomon, or the courage of Daniel.” I have prayer lists, but I don’t pray from top to bottom, or even all at one time. The Lord will bring them to mind throughout the day, often awakening me in the middle of the night and laying them on my heart. It took me a long time to learn not to simply “pray the list”. When you are in a fluid conversation with The Lord, the Holy Spirit will bring to mind those on your list in need throughout the day. Prayer is a gift from God, allowing us to communicate freely. Sadly, we often abuse the privilege and misuse the gift. This entry was posted in Mom2Mom and tagged intercessory prayer, Prayer, stuck in a rut, the Disciples Prayer, The Lor's Prayer. Bookmark the permalink.